TORONTO, Feb. 5, 2019 /PRNewswire/ -- Venus Concept Ltd., an innovative global medical technology leader, announces the launch of its latest medical device, Venus Heal™. With over 11,000 systems installed worldwide, Venus Concept has expanded their suite of leading medical devices and incorporated their most advanced technology into this latest innovation, intended for the accelerated healing of soft tissue injuries and conditions. 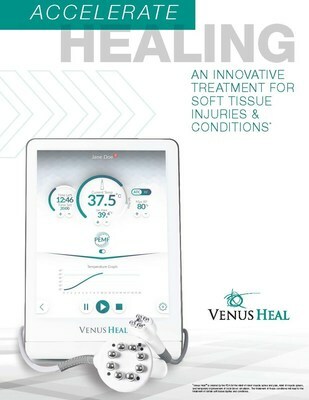 "We are thrilled to be announcing the launch of Venus Heal™ in the United States, namely because this state-of-the-art technology makes it an industry first for accelerated soft tissue healing," says Domenic Serafino, Chairman and Chief Executive Officer at Venus Concept. "Whether patients are athletes with acute injuries or workers with repetitive strain injury, Venus Heal™ offers the newest modality and the best solution to relieve pain, increase local blood circulation and increase range of motion through relief of muscle spasm. Combined with Venus Concept's unique business model, our customers realize a higher ROI with low-risk ownership. It's the perfect solution for all rehabilitation professionals." Venus Concept® is a leading global medical technology company that develops, commercializes, and delivers safe, efficacious, and easy-to-use non-invasive technologies and related practice enhancement services in a unique, industry-disruptive subscription-based business model. Venus Concept's devices have been designed in cost-effective and proprietary ways that enable the company to excel in multiple medical industries. The company has expanded its subscription platform and is now selling its devices in over 60 countries, including 27 with direct offices. Venus Concept has more than 400 global employees whose customer-centric approach has supported the company's rapid growth. For more information, please visit www.venusconcept.com.